I know I'm like six seasons late getting on the floral pants train, but it's just that I was waiting until I found the perfect pair. And find the perfect pair I did! I'm absolutely obsessed with the pattern and fit of these (a Forever 21 find, believe it or not) and they're so versatile. I've already worn them a handful of ways, but I think pairing them with my striped Zara blouse is my favorite. I mean, is there really a better way to pattern mix floral pants? Methinks not. What are your favorite floral pieces and how do you incorporate them in to the rest of your wardrobe? Love love this look- definitely can work dressed up with heels or down with flats! And man I need to start braving F21 again because those are a great find! 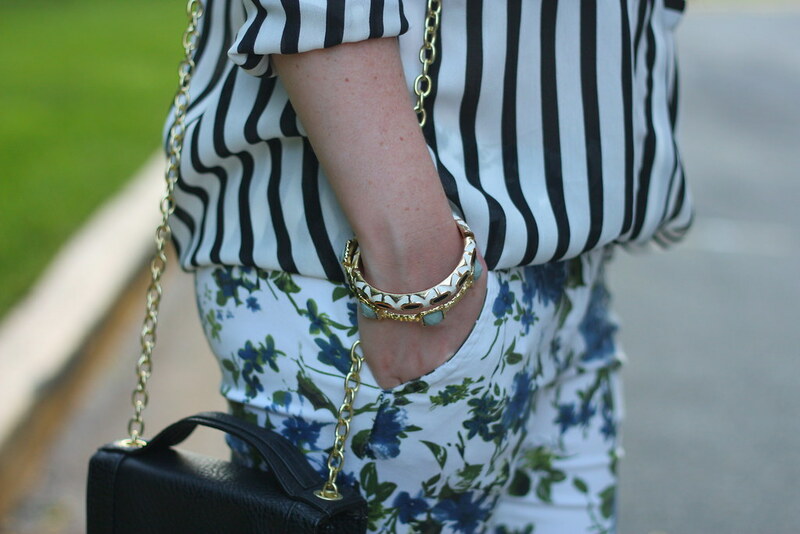 Stripes and florals are my favorite way to mix prints...love this look! Love this. Stripes and florals together is probably one of my favorites! Oh girl, I loveeeee this! I can't believe those pants are f21, I just might have to hunt those down! I went with stripes and florals last week -- the perfect way to add a little spice to two classic prints! Love the mixture of stripes and florals! You look fab! Super cute pairing. I heart floral pants! Great heels!! And those jeans are too cute!